This Sunday is the 30th installment of the WWF/E’s annual extravaganza and what is traditionally their second biggest show of the year. But what have been the highs and lows of the PPV’s long and storied history? Here we look at the best and the worst with regard to matches, booking decisions, angles and overall PPV experience. The return of Shawn Michaels was something that all wrestling fans had pined for since the talented performer had seemingly called it a day in 1998, stepping out of the ring to deal with severe back issues. Attempts by the Fed to get him back in action in 2001 were unsuccessful due to the personal demons that Michaels was battling but, after finding God and cleaning up his act, the stage was set in 2002 for a well-executed tale of betrayal and redemption. Having teased a DX reunion of sorts in the early summer, a mystery assailant waylaid HBK on an episode of Raw; perhaps unsurprisingly, this attacker turned out to be Triple H who had form for this sort of thing (see Steve Austin in 1999). HBK stoically claimed he had to return to the ring, primarily to show his son that sometimes to be a man, you have to fight. As life lessons go, this one turned out to be on the money, as the returning Michaels fought like a beast, putting in a stellar performance that, as ever, stole the show, surpassing even the most optimistic of fan expectations. His elbow drop from the ladder was the seminal moment of this match: everyone watching realised he still had IT and that this victory would likely lead to further appearances down the road. 90s Michaels was awesome but this performance put him on the path to becoming the undisputed GOAT. Sadly, Diesel and King Mabel’s 1995 title effort was a dour as Trips and HBK’s battle was uplifting. The go-home Raw closed with an angle in which the British Bulldog turned on Diesel and the PPV proper devoted considerable time to teasing run-ins from Davey Boy and his scorned tag partner Lex Luger in the main event. Such a distraction would have been a welcome addition to the match but bafflingly it was not delivered: viewers made do with a dull, clumsy match which Vince McMahon tried to put over as the most gruelling and gripping title match of all time. It really wasn’t. A good booking decision can please a crowd and make one show; a great booking decision can please thousands of punters for years. The ascent of Bret “Hitman” Hart in 1991 was masterful: after dropping the Tag Titles at Wrestlemania 7, Hart began winning singles matches, each week dispatching superior opposition en-route to his career defining battle with “Mr Perfect” Curt Hennig. The timing, venue and opponent was perfect and added layers to the Bret Hart mystique: for many years, Madison Square Garden was referred to as the Hitman’s arena and Summerslam as his event (he was invariably in the match of the night). Subtle touches throughout the contest, like the camera constantly cutting to Stu and Helen Hart, further enhanced the significance of the bout to Hart’s career and established this as the iconic Intercontinental title moment outside of Steamboat and Savage. Giving that a prior push for Bret in the 80s had failed and he was only a few months removed from tag teaming, this big win represented a brave booking decision and one that cemented the status of one of the biggest stars in history. Such bravery and vision was typical of the younger Vince McMahon; unfortunately by 2010, his desire to play it safe cut the legs out from beneath the Nexus. Although the group featured few grapplers with the potential to become major stars, as a faction they were fresh and relatively over and had they been pushed correctly, their leader Wade Barrett could certainly have been primed for big time matches (as might Skip “Ryback” Sheffield). While Barrett went on to battle Cena and Orton, he lost both rather lukewarm feuds and a planned ‘Mania match with the Undertaker was scrapped. The lack of momentum for the Nexus stemmed from Summerslam: with a 2 on one advantage on John Cena, Nexus should have defeated Team WWE and run roughshod until the rematch at Survivor Series. However, Vince’s conservatism kicked in, Super-Cena reared his head and just like that the run was as good as over. Honourable mention for Best Booking Decision: Brock Lesnar defeating The Rock to win the WWE title after only 5 months of active competition. Summerslam has had its share of scandalous moments: some of which worked and some of which really didn’t. 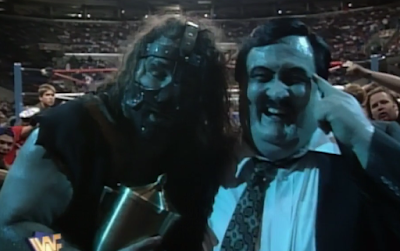 When Paul Bearer turned his back on his charge at the climax of the boiler room brawl at Summerslam 1996, only to turn around and slap and kick the Dead Man, it marked the end of an era. It cemented Mankind’s rising status, it forced Taker to re-think his presentation and it laid the foundations for the rise of Kane. It was an angle that was shocking, effective and significant. In recent years, WWE has struggled to duplicate the intensity of such angles and has resorted to celebrity involvement with comedian Jon Stewart getting involved in title matches year on year. Now Stewart is a fine broadcaster but he can't swing a steel chair to save his life. Interfering in the World vs US title for title at Summerslam 2015 was bad enough but to return as the fourth member of the New Day was even worse. I’m sure he’ll be back this Sunday: I just hope it’s in the shark-cage with Enzo. Honourable mention for Best Angle: The Mountie in Jail S’Slam ’91/ Undertaker and Jake Roberts crash the reception of Macho Man and Elizabeth’s wedding S’Slam ‘91/ Tatanka joins the Million Dollar Corporation S’Slam ’94. Honourable mention for Worst Angle: Two WWE titles on the line in the main event, a match which featured a special ref, a controversial finish, a sudden return of a legend and then a MITB cash-in. Overkill thy name is Summerslam 2011. This show represented peak Attitude Era. Granted, it didn’t have a bon fide classic match and featured one truly awful bout (the aforementioned Kai-En-Tai/ Oddities abomination) but the show dripped with energy and swagger as the WWF strutted into Madison Square Garden like a famed rock band and put on a high octane show that delivered all of the hits. From an opener that saw Val Venis and D-Lo Brown exude personality to the PPV debut of Edge, from Sable bossing her husband in the ring and X-Pac shaving Double J’s head, this undercard was good fun. The mid-card saw Owen Hart put on a wrestling match inside an Octogan as the action cut to the MSG theatre before the New Age Outlaws and Mankind threw out some catch phrases and smashed up some props. It was very late 90s and the crowd loved it for it. The Rock and Triple H both came of age in an underrated ladder match before Austin and Undertaker closed the show in an admittedly mildly disappointing match given the build and yet one which showcased their tremendous star power regardless. Throw in the killer AC/DC soundtrack and this show just feels special. 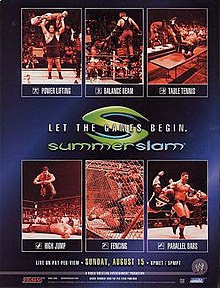 By stark contrast, Summerslam 2004, emanating from Toronto, lacked the verve and energy that made the Garden card feel so vital. It featured plenty of forgettable action from performers far from their best (Edge was floundering here as were Matt Hardy and Batista while even Chris Jericho seemed out of sorts). JBL’s ordinary title defence against the Undertaker spoke to the lack of excitement in the product at this time; this show felt like it was just there to fill time, performers sleepwalking their way towards something of more consequence. True, there was some half-decent action but nothing really sparked and ignited the audience: Angle vs Guerrero wasn’t close to where it could have been and despite his best efforts, Benoit’s passing of the torch to Orton was tepid. That the only real moment of the show, Orton’s coronation as the youngest world champion of all time, has been whitewashed from history says it all about this better forgotten event.